Newly engaged? Welcome to Arizona’s Finest Wedding Sites and Services, the ultimate resource for planning the perfect Arizona wedding! Our magazine and website are comprehensive resource guides dedicated to helping engaged couples discover their ideal Arizona wedding site and services. Phoenix Bride & Groom and Tucson Bride & Groom offer comprehensive wedding planning information for the sophisticated couples who live in or are planning to be married in the Phoenix, Tucson and surrounding areas, with a focus on upscale regional resources. Our goal is to give couples all the information they need to plan and execute the wedding of their dreams, from stylish accessories to finding top local wedding professionals. 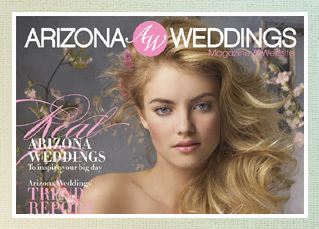 Arizona Weddings Magazine & Website, Arizona’s #1 bridal publication, is dedicated to providing the most comprehensive and useful wedding-related resource for brides and their families. With information from over 400 seasoned wedding professionals and service providers, Arizona Weddings Magazine & Website is ALL YOU NEED when planning an Arizona wedding.